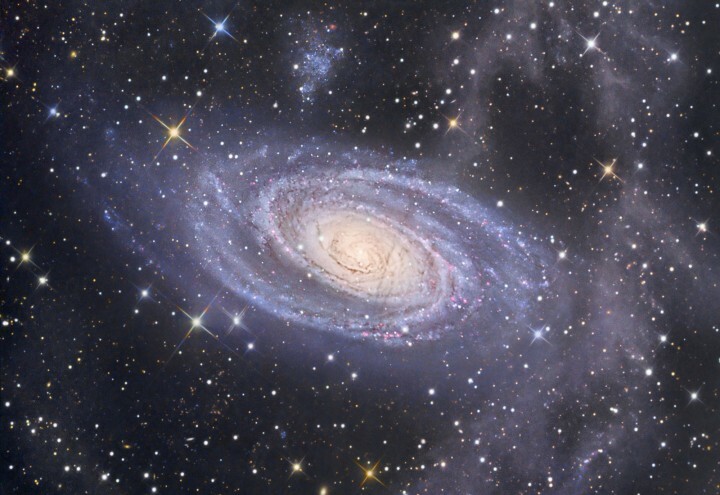 Explanation: One of the brightest galaxies in planet Earth's sky and similar in size to the Milky Way, big, beautiful spiral M81 lies 11.8 million light-years away in the northern constellation Ursa Major. This remarkably deep image of the region reveals details in the bright yellow core, but at the same time follows fainter features along the galaxy's gorgeous blue spiral arms and sweeping dust lanes. Above M81 lies a dwarf companion galaxy, Holmberg IX, sporting a large, pinkish star-forming region near the top. While M81 and Holmberg IX are seen through a foreground of stars in our own Milky Way galaxy, they are also seen here through a much fainter complex of dust clouds. The relatively unexplored clouds are likely only some hundreds of light-years distant and lie high above our galaxy's plane. Scattered through the image, especially at the the right, the dust clouds reflect the combined light of the Milky Way's stars and have been dubbed integrated flux nebulae.